An 800-bed student housing tower, designed by architects Studio One Eleven will go up in Downtown Long Beach as part of the CSULB Village development. 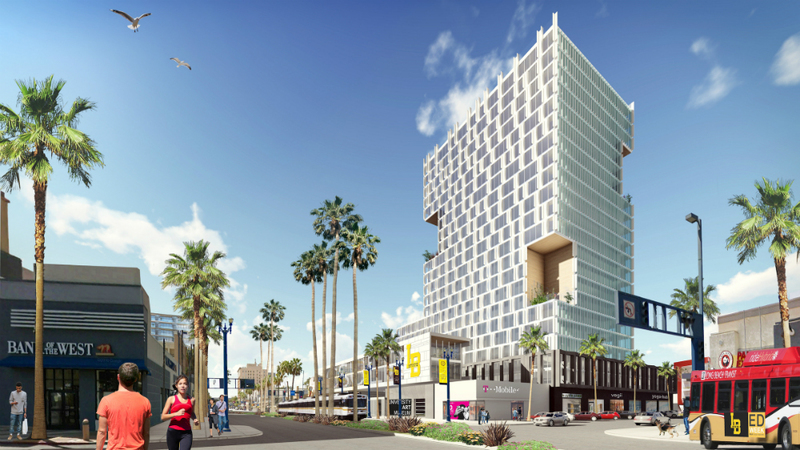 Yesterday, Long Beach Mayor Robert Garcia announced a new partnership between Shooshani Developers and the California State University, Long Beach (CSULB) that will bring an 800-bed student housing tower, designed by architects Studio One Eleven, to Downtown Long Beach. The project partners are working toward the implementation of the so-called CSULB Village development, a student-focused mixed-use district that will boost the university’s presence in Downtown Long Beach, as the city’s mayor aims to enliven the district via increased density and pedestrianization improvements. The new district will include a 22-story mixed-use tower containing student housing and 50 units of university staff housing. The complex will also house 16 meeting rooms, a 5,000-square-foot innovation center, a 10,000-square-foot CSULB-run art gallery and museum, and 45,000 square feet of ground floor retail. A rendering accompanying the release by the developers depicts a rectangular tower rising out of a two-story podium. The blocky tower has multi-level loggia cut out from its mass at different heights along each the corners. The tower also features gridded facades along each exposure, with certain facades populated by vertical louvers. The tower will be located near another recently-announced CSULB project that will be developed by Ratkovich Company, Urbana LLC, and Owl Companies. The so-called Broadway Block complex would bring a new 375-unit mixed-use development to the area in a complex marked by a 21-story apartment tower. Construction on the CSULB Village complex is scheduled to begin Fall 2017; a completion date has not been announced for the project.